The Pachelbel Trio consists of flute, violin and cello. 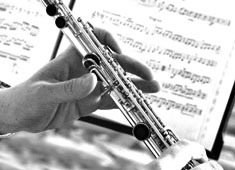 The presence flute adds an extra colour to the string sound making it a little different from a string trio. We have an extensive repertoire including music by Mozart, Haydn and Vivaldi, but are not averse to dipping into arrangements of jazz standards and songs from the shows. The members of the trio are all performing regularly with the major Scottish Orchestras and play together as a group in places such as House for an Art Lover, Pollok House and many other venues in Scotland. We can provide stylish entertainment for your wedding or function and provide an alternative to a quartet where space is a premium.